A wave of domestic-violence scandals rocks the league. Is the most powerful man in professional sports about to lose his $44 million-a-year job? That’s what the sports world is wondering following a month in which NFL commissioner Roger Goodell was exposed as an utterly insensitive, incompetent cover-up artist. Goodell has fumbled before—on the issue of head injuries—but this time he erred on the more sensitive and far-reaching issue of domestic violence. Goodell’s problems started over the summer when he suspended Baltimore Ravens player Ray Rice for two games under the NFL’s personal-conduct policy following the star running back’s assault on his then-fiancée Janay Palmer (now Janay Rice). Video had emerged of Rice dragging an unconscious Janay from a casino elevator in Atlantic City, New Jersey. If Goodell had just suspended Rice for eight games at that point, all of the following may never have taken place. First came a wave of grassroots condemnation for the light two-game suspension. Then, before the start of the season, Goodell backtracked and said that he was wrong on the Rice suspension; there would now be a new get-tough policy on domestic violence whereby players would be suspended for a minimum of six weeks and could receive a lifetime ban. Some applauded this decision. Others thought it was a pure public-relations stunt that might in fact discourage the wives and partners of NFL players from coming forward if they feared the loss of their partner’s very short but lucrative NFL career. Even more people asked whether the NFL is qualified to act as a family court and suggested that perhaps the focus should be on why the legal system is so terrible on handling incidents of domestic violence. Whatever people’s position, the drama for Goodell and the NFL was only just beginning. On September 8, the bottom-feeding gossip website TMZ Sports put video footage online of Ray Rice’s assault on his fiancée in that Atlantic City elevator. The video, shown on a constant loop across the media, was released and replayed without the consent of Janay Rice—an act that many domestic-violence counselors I interviewed found stomach-turning. Nonetheless, the video was revelatory. Unlike what the Atlantic City police, the NFL and the Baltimore Ravens had led people to believe, Janay Rice played no role in provoking her husband; both were not at fault. The Baltimore Ravens immediately released Rice from the team, but that in no way slowed the outrage. Journalists and independent bloggers started to look more closely at Goodell’s record on handling domestic violence, and it was ugly as sin. 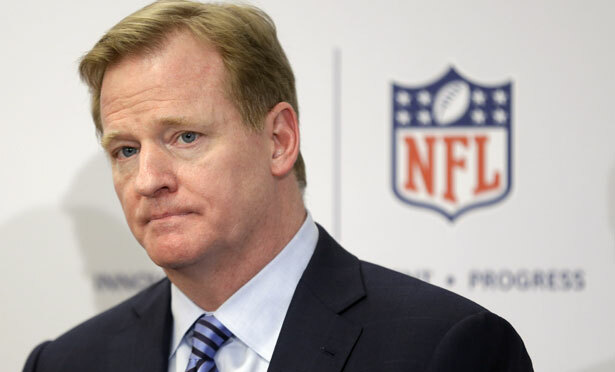 Fifty-six players have been arrested on domestic-violence charges during Goodell’s eight-and-a-half-year reign, yet they were suspended for just a combined thirteen games. Then more cases were examined of players who had been arrested or convicted of domestic violence but, not having been caught on video, were still on the field. Amid all this, Minnesota Vikings star running back and former NFL Most Valuable Player Adrian Peterson was suspended for beating his 4-year-old son bloody with a switch. His team’s management looked utterly flummoxed about how to handle the crisis in a rapidly changing climate; in one week they suspended, unsuspended and then, when sponsors started to get angry, resuspended Peterson. With their commercial backers increasingly nervous, and the public still in a state of outrage, NFL owners are starting to squirm. Now Goodell could be on a toboggan ride right out of the job. The only thing keeping him afloat is not his much-vaunted moral compass but the billions of dollars that keep pouring into the NFL’s coffers. Just how long his money-making abilities will trump all other concerns is anyone’s guess. What’s particularly ironic is that Goodell is being brought down by his own history of treating the NFL Players Association like a junior partner, at best, in this process. Goodell would not collectively bargain any kind of personal-conduct policy with the Players Association, demanding instead to be judge and jury in all off-field matters. That means he gives the suspensions, and he is the person to whom the players must appeal, which means that there is no consistency to how the NFL penalizes, or doesn’t penalize, players for off-field incidents. Goodell has been free to do things like allegedly cutting a deal with Baltimore Ravens owner and golfing buddy Steve Bisciotti to make sure that Rice received only a two-game suspension (Bisciotti denies this). As a result of his arrangement, Goodell, despite constant moral posturing, is always in reactive mode, careening from one PR crisis to the next. Now, irony of ironies, Goodell needs the union. He needs a series of collectively bargained rules that are transparent and clear to fans, players and sponsors. The question is whether he is too thick-headed, or too resolutely anti-union, to see it.